Vonetta Flowers was born October 29, 1973 in Birmingham, Alabama. In 1992, Vonetta graduated from P.D. Jackson Olin High School. She was the first person in her family to go to college. She graduated from the University of Alabama at Birmingham. She is married to Johnny Mack Flowers, who is also her coach.On February 19, 2002, Flowers won the Gold Medal for Bobsled and on August 30 that same year, delivered twin boys, Jorden Maddox (born hearing impaired) and Jaden Michael. Vonetta Flowers was the first black athlete (male or female)--from any country--to ever win an Olympic Winter Games gold medal. 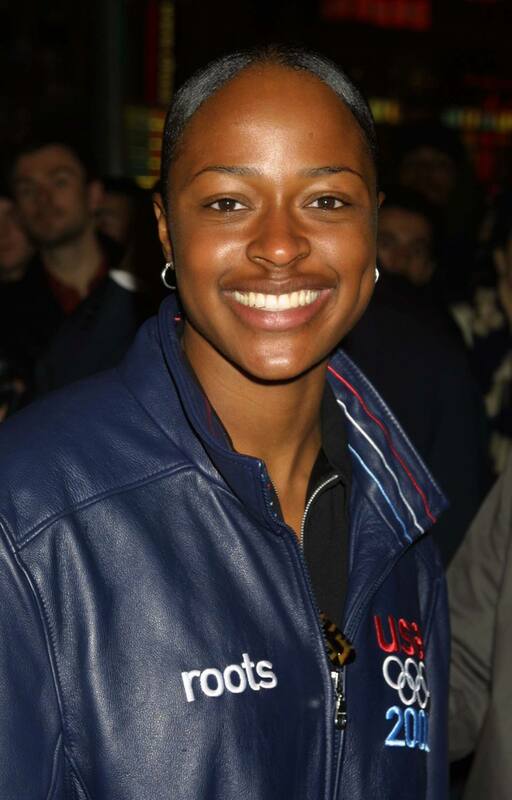 In the 2002 Olympics in Salt Lake City, Vonetta and Jill Bakken drove USA to an Olympic gold medal, ending the United States' 46-year medal drought in bobsled. The 2-woman bobsled team's time was 1 minute 48 seconds. For a more detailed look at Vonetta Flowers' awards, check the Olympic site. Vonetta Flowers was recruited, at the age of nine, out of a group of Jonesboro Elementary School children by Coach DeWitt Thomas, who was looking for the fastest runners. Over the next ten years, Vonetta won almost every race that she entered. During high school, she participated in track and field, volleyball and basketball. After 5 surgeries in eight years, Vonetta had a disappointing performance at the 2000 Olympic Trials and decided to give up her athletic career. Two days after the disappointing 2000 Olympic Trials, Vonetta's husband, Johnny, spotted a flyer urging Track and Field athletes to tryout for the U.S. bobsled team. Vonetta wasn't interested, but decided to accompany her athelic husband as he tried out for the team. Shortly after the tests started, Johnny pulled his hamstring. Vonetta decided to help him live out his dream by completing the six-item test. She immediately made the team. Vonetta Flowers quickly became the #1 brake woman in the U.S. By the end of her rookie season, Vonetta and her former teammate, Bonny Warner, were ranked 2nd in the US and 3rd in the world. But it was her new partner, Jill Bakken, who slid into history with Vonetta by winning the Gold Medal at the inaugural Women's Olympic bobsled event. Now Vonetta Flowers is back for the 2006 Olympic Winter Games in Torino, Italy. Vonetta is the 1st person from Alabama to win a medal in the Winter Olympics. Vonetta started bobsledding when she was 26 Years Old. While in college, Vonetta won 35 conference titles and victories in the Penn Relays and The Olympic Festival. Vonetta was the University of Alabama/Birmingham's 1st seven-time All-American. Vonetta would love to compete in the 2008 Olympics as a gymnast. We'll just have to wait and see about that one! Bobsledding started in the late 1880's in Albany, New York. It first appeared in the Olympics in 1928. United States Bobsled and Skeleton Federation (USBSF) is the governing body for bobsled and skeleton (a head-first version of the luge). There are two types of athletes: drivers and pushers. Vonetta Flowers is a pusher or brakeman and sits in the back of the 450-pound sled. She is responsible for pulling the brake (a metal claw that digs into the ice) after the sled crosses the finish line. She was named one of Essence Magazine's 50 of the Most Inspiring African-Americans. Vondetta was named one of Ebony Magazine's 57 of the Most Intriguing Blacks. Flowers was listed in People Magazine's 50 Most Beautiful People. Visit Vonetta Flowers to read more about this amazing woman and athlete. You'll find out more about her deep faith and personal life on her website.